AU COEUR DE LA RIVE DROITE – Idéalement situé à deux pas de la cathédrale Notre Dame de Genève et de la Gare Cornavin, le Bagatelle est l'établissement qui sauve quiconque ayant une fringale en dehors des heures de restauration. UN CHEF D’EXPÉRIENCE – Christian Guichard (grand Chef de Bourgogne, Toque Gault & Millau) est aux commandes de la cuisine du Bagatelle depuis 2012. Il vous livre sur un plateau son immense expérience : la fraîcheur et l’authenticité sont ses mots d’ordre. UN LIEU QUI INSPIRE – Le Bagatelle vous accueille dans un décor atypique, à la fois moderne et baroque, relevé par l'élégance de son bar en bois massif, ses banquettes confortables ainsi que ses grands espaces. Car park Parking de la Place de Cornavin S.A.
We did go on 1 January and it was busy but honestly food mediocre and service super slow even though the waiting staff were very pleasant. We would not return. The food was tasty. My toddler enjoyed the kids meal. The atmosphere was very friendly, cosy and welcoming. The service was excellent and attentive. The food was tasty and worth the money. The place was not very noisy and too busy where you can't talk to one another. Love it. 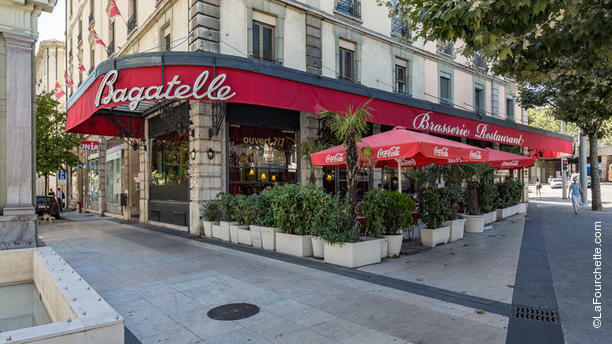 Bagatelle is open on major holidays (a plus) and very convenient (near the train station). It compares favourably with a good American diner offering good food at fair prices by Geneva standards. Christmas Eve they appeared to be understaffed to efficiently serve the large group of clients. Food was good in presentation and quality. Will return again. A great place for fine dinning. To recommend! Always very friendly and efficient service! Varied menu at decent prices. I have been coming here for years and have never left disappointed! Good service and ok food. L'entrecote sauce Bagatelle reste toujours un must ! Good service but poor standard of meat used in both the chicken salad & macaroni with lardons . Horrible service. We ordered apps and drinks and took over an hour for the apps to arrive. Didn't even have time to order a main course. And the food was incredibly disappointing. Extremely expensive meal. One of the most in our entire stay in Geneva and the food was certainly not worth it. Plus, he charged us for a tip when, as I understand, none is required. Prices are fair for Geneva. The food was good. We were there with a rather large group, but the service handled us well. The restaurant itself has a nice touch to it. The risotto was great! Service was slow. The food was great. I got what I ordered, and it was delicious. Although the vegetables were a bit overcooked. They had one waiter who spoke English, and he was great.